Wednesday was my second anniversary in the fair city of Baltimore, Maryland, and I was in the mood to celebrate. How? By taking the bike out for a ride to see if we might get ourselves lost. It is amazing how quickly I can figure I can’t get lost anymore, and how quickly I can get lost again if I just take a slightly different turn. This day’s ride started with an easy pedal over to and around and around Lake Montebello, because for a minute I just wanted to ride without fear of cars, a song in my ears. I veered over toward Herring Run Park on the second lap, bouncing over the tree-rooted trail and along the water, surprised again that this is Baltimore and just a couple of miles from my house. I snapped this picture of layers of ivy covering over trees and bushes, everything growing all at once into a mass of lush green. I’m sure that’s an invasive species, but damn, it’s pretty. And then I was out of the park and riding around Belair-Edison, and I only knew I was there because of a road sign. I found myself on Edison Highway in the section that feels like an avenue and on Erdman Avenue in the section that feels like a highway. I passed Baltimore Hebrew Cemetery and thought about how segregation doesn’t end in death even. I pedaled past several shopping centers open for business during the construction and wondered how that’s working out for them. I dead-ended at a parking lot construction project, went back the other way, and found myself riding behind a long, long row of warehouses and trucking facilities, and at the top of the hill I could see that way was toward the harbor, and this way was toward city living. I traced my way here and there until suddenly there were signs for Butcher’s Hill and the trees that plant the neighborhoods on that side of the line. I rolled down to Fells Point, stopped for new rear brake pads–the Surly deserves an anniversary present too–and then settled in for a couple of beers and some baseball before riding over to meet A., K., and J. to celebrate and raise money for Wide Angle Youth Media, a most excellent organization in this city that helps young people learn to make their own (very good) movies. We toasted our collective love of this place and then it was off to ride back up the hill. Thank you, Baltimore, for two most excellent years, and to N., who knows it’s bittersweet to be two years gone; she showed up at my door with an assortment of beers from Abita and some tiny chocolate bars from Sucre, the perfect end to a perfect day of being home. This entry was posted in bikes, parks, personal and tagged anniversaries, Baltimore, Baltimore Hebrew Cemetery, Belair-Edison, Brewer's Hill, Fells Point, Herring Run Park. Bookmark the permalink. 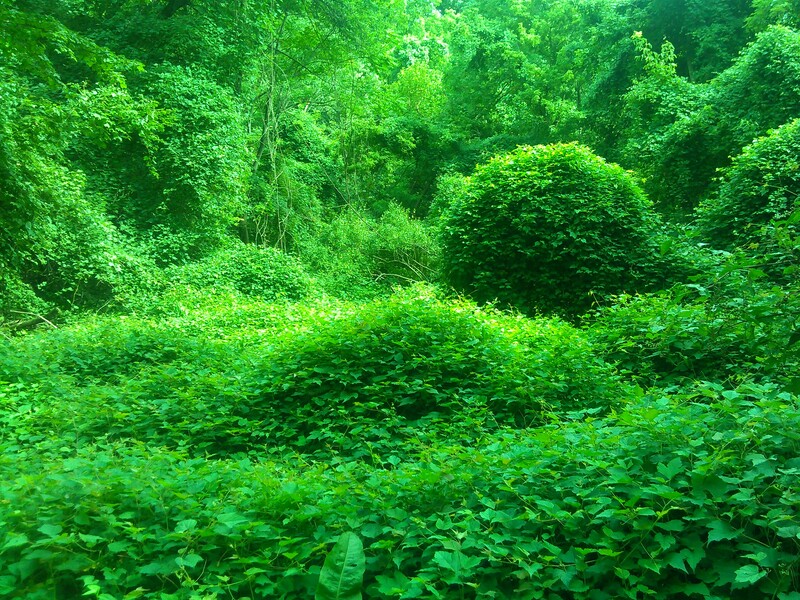 I wish I could lay on that lush overgrowth for a week without having any thought processes at all.